Fundy Model Forest was formed in 1992 when Natural Resources Canada initiated the Canadian Model Forest Program. The program principle was to allow Canada to take a lead role in defining and implementing sustainable forest management concepts and to facilitate knowledge transfer to accelerate sustainable practices. Ten demonstration initiatives or “Model Forests” were started across the country reflecting a variety of cultural values and ecological diversity. They served as incubators that explored and illustrated concepts and best practices in forest management. The Model Forest Program was a precedent-setting initiative that sought to achieve innovation through partnership, generate new ideas, and find on-the-ground solutions to sustainable resource management issues. Over the past 27 years, Fundy Model Forest’s partners have been, and continue to be, leaders in advancing sustainable resource management in the Acadian Forest Region. 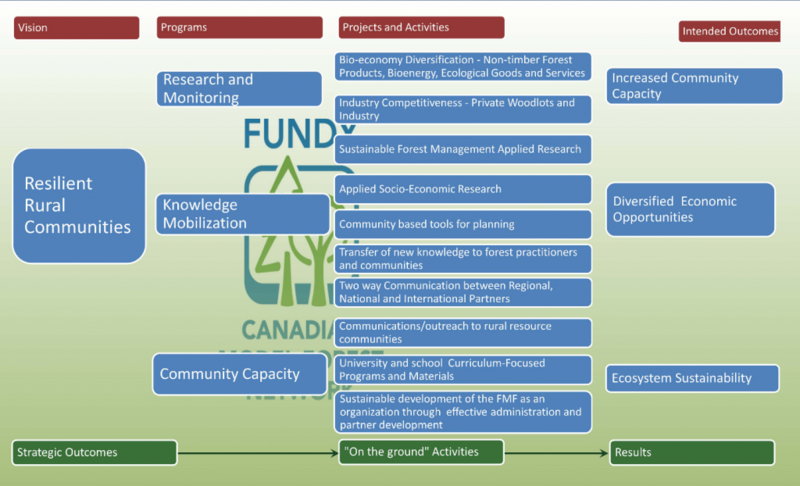 The Fundy Model Forest is conducting research that has practical application in daily work in the forest, testing and piloting new tools and approaches to resource management, and transferring this knowledge and innovation to managers in the Model Forest and beyond. Fundy Model Forest is located in the Acadian forest region of Canada, a landscape of mixed forests and topography where the hardwood forests of the south meet the conifer forests of the north is the setting for an ecologically complex mosaic. Fundy Model Forest contains 30 different species of trees, 45 species of mammals and 110 species of birds. The Fundy Model Forest landscape is a mixture of forests and farms, many of which are located along the Kennebecasis River or smaller rivers and streams. It also touches on the Bay of Fundy coast. Around Sussex the topography is rolling hills, which become much steeper near the coast. Dr. Dave MacLean, Faculty of Forestry and Environmental Management at the University of New Brunswick, is the Chair and President of the Fundy Model Forest. 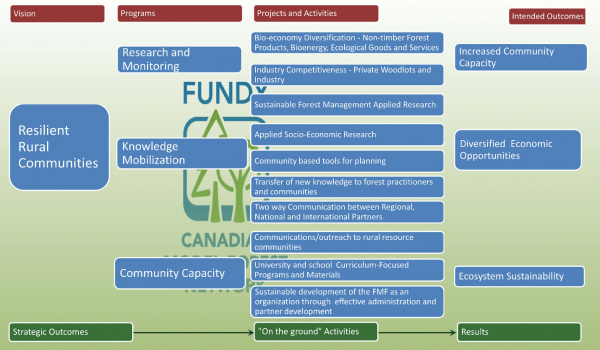 The Fundy Model Forest vision is about resilient rural communities. The organization therefore works on those 3 strategic programs: Research and Monitoring, Knowledge Mobilization, Community Capacity. Sustainable development of the Fundy Model Forest as an organization through effective administration and partner development.